“BETTER RAZEM” translated from Polish as “Better together” was printed across the caps of Agi & Sam models as their AW17 designs walked in this weeks LFWM, giving an affectionate nod towards Agape Mdumulla and Sam Cotton’s designing partnership. 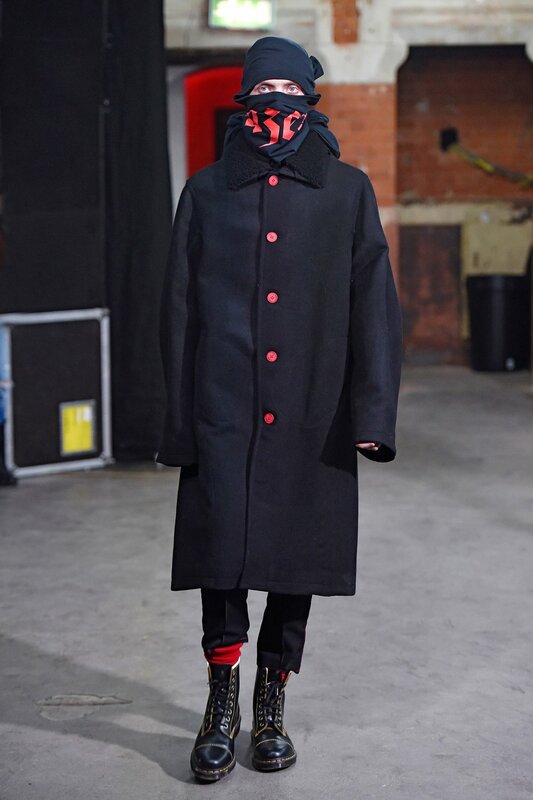 The collection maintained a strong woollen focus throughout, present in every look, from the more prominent pieces of oversized coats and knitted jumpers to the low-key pulled up socks and scarfs that covered the models mouths in a balaclava like fashion. Models were dressed in turtlenecks, knee length jumpers and woollen trouser and cardigan two piece combinations as the hand woven textures dominated Mdumulla and Cotton’s designs. 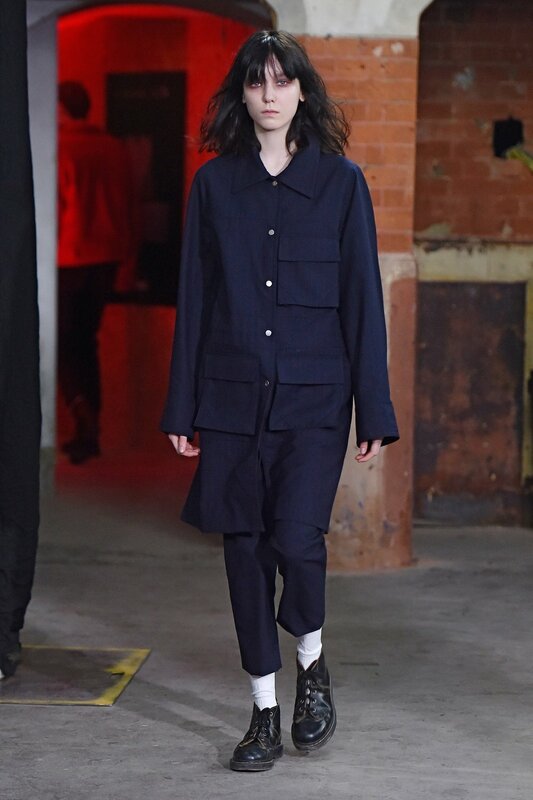 Agi & Sam’s collection was ominous and intimidating, taking influence from gang culture and it’s concealing facades. Models were draped in heavy double breasted coats, loose trousers and bulky boots. Tailoring was frayed, hemlines were lowered and sleeves hung below wrists to construct mysterious and relaxed outlines. Leather also made a reccurring appearance as Mdmulla and Cotton repeated pieces from this AW17 collection, mimicking them identically, only altering the fabrics for leather in place of wool. Colour-blocking was a continuous theme throughout, bomber jackets and leather windbreakers sported scarlet accents alongside their otherwise monochromatic colour palettes. 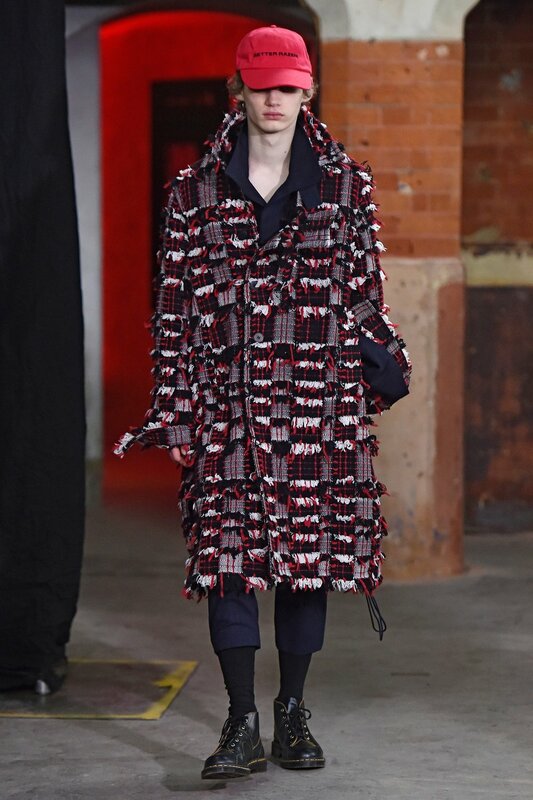 Brief uses of navy and plaids also emerged within the collection, adding a softer edge to the menacing aesthetic of the menswear line, whilst piping traced the edges of their coats to give a more bold and refined finish to these otherwise traditional pieces. Agi & Sam’s collection was daring and unapologetic. 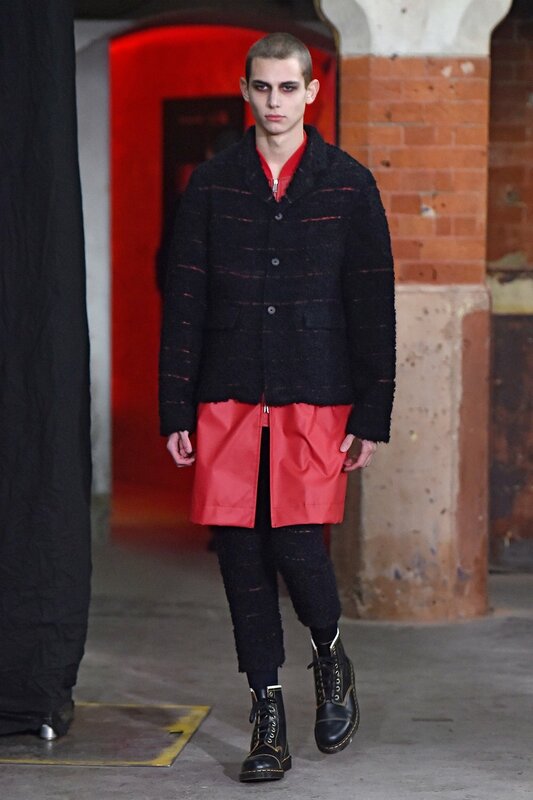 Their designs were intensified further by their exclusive approach to their favoured woollen fabrics and although striking, their gang fuelled designs obtained a desirable and tangible quality both on and off of the runway.